On the way to Swakopmund from Windhoek along the B3 you will notice a mountain range, called the Pontok Mountains rising up out of the barren landscapes. The Spitzkoppe, known as the Matterhorn of Namibia and towering at 1 784m above sea level, forms part of this range. Don’t hesitate. Take the 20km detour off the main road for a closer view of this 120-million-year old behemoth and you will be greeted by unbelievably surreal scenes. The panorama is in fact so surreal that it has been used as a backdrop for movies such as Stanley Kubrick’s 2001 Space Odyssey and 10,000 BC. While the Spitzkoppe reaches nowhere near the 4 000m heights of the Matterhorn, it is similar in appearance and one of only 3 granite plutons in southern Africa. As such it simply has to be summited by those who like to climb, and has been since 1904. During 1971 a party led by JW Marchant of UCT once climbed to the peak in 4 hours, scaling the lower pitches without ropes or using the artificial steps hacked into the granite. On their descent, legend has it that rain fell for the first time in over a year as they reached the base of the mountain. Mountaineers took this as a good omen and since then the Spitzkoppe has welcomed all levels of climber, from those wanting to scramble among the rounded domes nearby, to those aiming straight for the top. There are about 100 sports climbing and bouldering routes on and around this granite massif and true enthusiasts claim that they can amuse themselves for a week or more while camping around the Spitzkoppe. 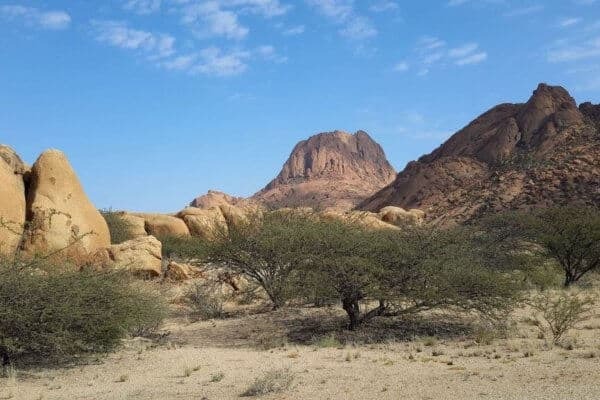 For many years, visitors would simply pitch their tents where ever they liked but in recent times the Spitzkoppe has been placed in the care of the local community and things have since been considerably more organised since then. However, the campsites remain basic, with fireplaces, refuse bins, pit toilets and a free for all policy with regard to site allocation – perfect for those who like their African experiences pure, simple and rough. If you prefer a little more comfort, there are a few traditional Damara-style huts for rent, but you still need to bring all your own supplies, including water. Sunblock and a hat are a must for all activities in Namibia’s hot climate, a sturdy pair of hiking shoes will make your explorations a lot more comfortable and a good pair of gloves is essential for climbing activities. The charms of the Spitzkoppe are not limited to rock climbing either. Less adventurous folk can content themselves with hiking or birdwatching among the brilliantly coloured rocks. Rock hyrax, black mongoose and small spotted genet are often spotted on these walks. The bird list has over 200 specimens on it, including the rare Herero chat. The prehistoric cave art to be found here is something quite special. Ask one of the local guides to take you to Rhino Rock, where you will find drawings created between 2 000 and 4 000 years ago. Stargazing is another treat for those staying over, with billions of celestial bodies lighting up the pitch-black sky at night. The Spitzkoppe remains relatively undiscovered, with few visitors, adding peace and quiet to the list of attractions to be found here. This is an inexpensive destination with only a small entry fee into the conservancy area and modest overnight rates which all go directly to the local community. You can support the community even further by purchasing from the onsite shop which is filled with their handiwork and by making use of the local guides which operate from here. The Spitzkoppe is one of Namibia’s lesser-known treasures and deserves a place on every visitor to Namibia’s to-do list.